This Old Bar | The Bar Guide | Style Weekly - Richmond, VA local news, arts, and events. Keeping the taps flowing at an 70-year-old institution. 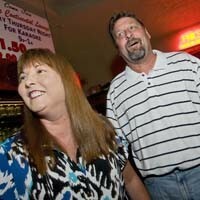 Kyle and Katy Measell, owners of Philip&apos;s Continental Lounge (5704 Grove Ave.), used to hang out there in the mid-&apos;70s when the place was hopping on Thursday nights. Opened in 1939 by the Shaheen family, Phil&apos;s still thrives, its customers a mix of young and old. After a few managerial changes, the Measells took over in 2003, determined to add their personal touches while keeping the fun vibe customers loved in the first place. Kyle Measell tells us how to keep an 70-year-old, perhaps slightly tipsy, warhorse running. CORRECTION: In the original version, we reported that Phil's is 80 years old. It is 70.